Robb and Bob approach the study site. We might be enjoying the first spring days down here in the valley, but let me tell you, it’s still winter up in the mountains. 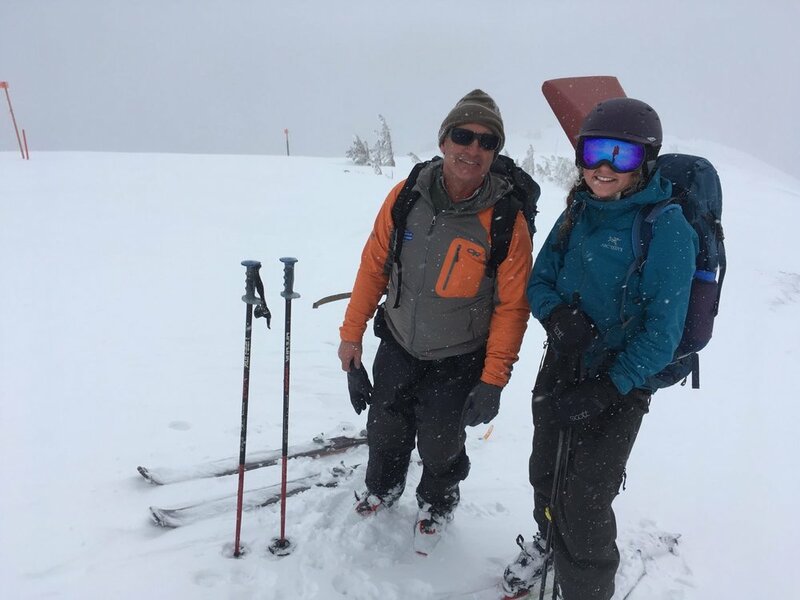 A few days back, I joined Robb Sgroi, the Land Resources Specialist for Teton Conservation District, and Bob Comey, an avalanche forecaster for the Bridger-Teton Avalanche Center on an adventure off the backside Jackson Hole Mountain Resort. 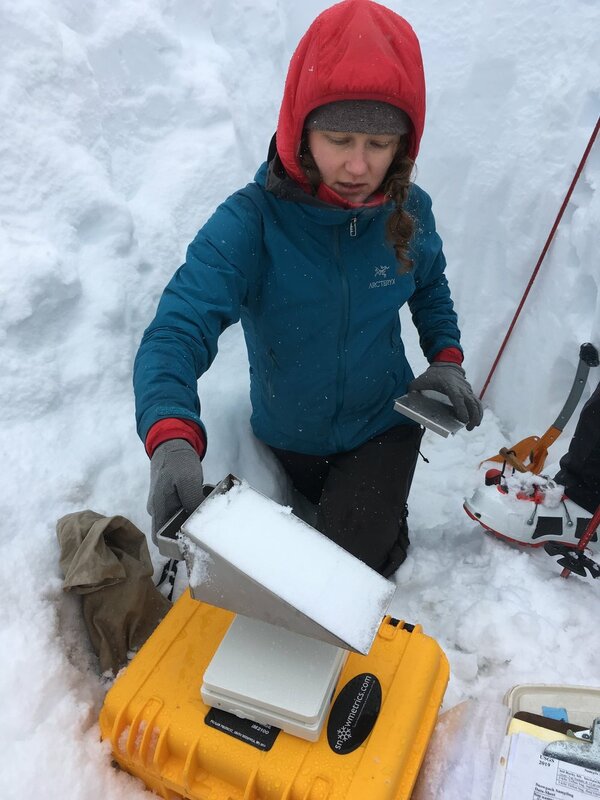 Since 1993, the U.S. Geological Survey (USGS) has sampled snowpack annually at over 50 sites in the Rocky Mountains—including seven sites in Teton County—to determine levels of nutrients and chemical constituents in the snow in sensitive higher elevation mountain watersheds. Known as the Rocky Mountain Snowpack Monitoring Program, the long-term study is the most expansive and comprehensive snowpack monitoring effort of its kind. Teton Conservation District supports the project financially and offers technical assistance on an annual basis. This year, our very own Robb Sgroi led the sampling. Robb shovels and Bob examines snow grain types. Phoebe measures Snow Water Equivalent (SWE). We caught the pre-opening 8:00 tram, stopped for a transceiver check at the top, and skied down to a clearing in the trees of Targhee Woods. Robb has visited this exact same spot every winter for the past six years. The first thing we had to do was dig a snow pit all the way to the ground. An hour or so later, we hit dirt and the top of the roughly 9-foot pit was well above Robb’s head (he’s 6’4” for scale!). We started by measuring the snow temperature and snow water equivalent at 10 cm intervals. These measurements tell us if the snow is isothermal, meaning the snowpack is 0°C throughout and has therefore begun to melt and leach chemicals, making the data unreliable. The snowpack was not isothermal yet, so Bob Comey gave me a lesson on the different types of snow grains we were seeing. We then defined snowpack hardness, measured on a scale of what it takes to penetrate the snowpack. If only a knife can pierce the snow, it’s really hard, and then the scale moves up to a pencil, one finger, four fingers, and finally soft snow only takes a fist to punch through. For the most part, the snow got harder and wetter as we moved closer to the ground, except for the bottom 1/3 of the snowpack, which was a bit dryer than the middle section. Overall, it was pretty uniform snowpack that made us hopeful for some good spring skiing. The last step in the procedure was to gather a snow sample by scraping a column of snow from top to bottom and sealing it in a sterile bag. Through dry and wet atmospheric deposition, precipitation and gravity deposit particles, aerosols, and gases in the atmosphere onto the ground. When that precipitation comes in the form of snow, the layers of snow store and illustrate what was deposited throughout the season. The high elevations here in Jackson do see rain, but most of the winter precipitation comes in form of snow—thereby showing us the chemistry of most of the annual precipitation in one convenient column of snow. This boxplot shows the outliers (black circles), 10th and 90th percentiles (whiskers), 25th and 75th percentiles (box), and median (black horizontal line) concentrations for the 2018 Rocky Mountain Region snowpack chemistry data. The red open circles show the concentrations for the sites in Teton County that are supported by Teton Conservation District. Concentrations are reported in microequivalents per liter (μeq/L) or or nanograms per liter (ng/L). Graphic and data from USGS. The results show dilute chemical concentrations of dissolved nitrate (NO3-), dissolved ammonium (NH4+), dissolved sulfate (SO42-), acid neutralizing capacity (ANC), and total mercury (Hg) across the Rocky Mountains. The five sites in Teton County in 2018 had dissolved ammonium concentrations that were roughly the same as the regional median, total mercury concentrations greater than the regional median, and dissolved nitrate and dissolved sulfate concentrations that were less than the regional median. Through this program, long-term snowpack chemistry trends are being developed and we can use this to estimate “normal” levels, identify areas where atmospheric deposition of acidic compounds could be a concern, and monitor regional or local sources of pollution. Bob and Phoebe smiling at the end of the day. Fun fact: One of Phoebe’s closest childhood friends is Bob’s daughter, Danika. We’ve shipped this year’s sample off to USGS for analysis. We won’t hear back for some time on what this year’s snowpack was storing, but you can check out the data from 1993 to 2019 by clicking here.